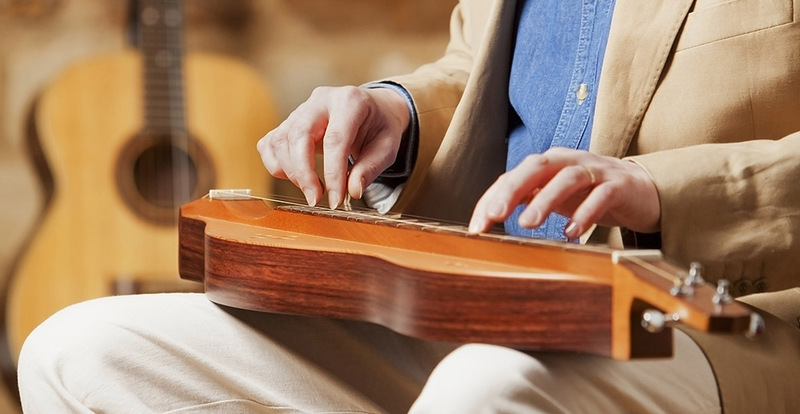 Some dulcimer players favour plastic or even metal fingerpicks, which seem to work particularly well on the banjo as they give a clear and loud sound. I prefer to use my fingers however, which allows me to fingerpick more quickly and precisely. I am assuming throughout that the reader is right-handed and that their dulcimer has 3 strings, or 3 sets of strings. You will need to look after your nails to fingerpick well. Strong nails need a healthy diet and to that end some guitarists eat a cube of raw jelly each day. If your nails regularly crack or break, then you might look to adding a calcium supplement to you diet. Do check with your GP or pharmacist first though, as too much calcium could be harmful. Oils help too, either a commercial nail oil or pure olive oil. A drop of oil massaged into your nails on a regular basis will help to keep them strong. Assuming you don’t have false nails or use nail varnish, which classical guitarists generally avoid, then a regular manicure routine is recommended. I manicure weekly, to keep my nails in good shape and also the night before a concert, as newly shaped nails give a crisp, clean tone. Using a blunt nail file, start by gently pushing back the cuticle using the flat side of the file’s smooth tip. This stops the cuticle from growing over the nail. Then gently smooth the upper surface using a nail buff to reduce or remove ridges, which are where breaks in the nail are most likely to appear. Always file your nails using a fine emery board, never cut them using scissors or clippers, which can stress the nail. Shape your right hand nails into a smooth curve, avoiding sharp corners. Finally, profile the right hand nails such that the upper edge is slightly rounded but the lower edge is sharp. Your left hand nails should be short. If you touch your left hand fingertips vertically onto a smooth, hard surface the nail should just touch the surface after applying a little pressure. Nails that are too short will eventually cause your fingertips to become spatulate. If they are too long you won’t be able to fret the string correctly, inhibiting your playing and potentially marking the fingerboard. The nail length on your right hand is more a matter of preference. As a general rule long nails give a sweet, soft sound, whereas short nails will give more volume and allow for greater speed and accuracy. Bearing this in mind, I manicure my nails to be slightly longer for playing the dulcimer, than the guitar. In general, your nails should be short enough to allow your fingertips to touch and dampen the string when it is plucked but not so short that you have to hook your fingers to catch the string. Indeed, this is the key to successful fingerpicking. Counter-intuitively, you do not actually pluck the strings with your nails. 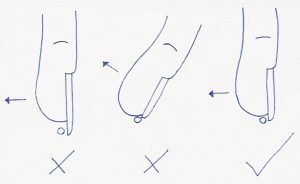 Just before you pluck, let the pad of your fingertip rest gently on the string. This dampens the string, stopping the previous note. Even if you are fingerpicking very quickly, every single note is stopped before the next one is played. Then, when the note is ready to be played, pluck the string using the pad of your fingertip, not your nail, by pulling the string sideways. As your finger leaves the string, your nail with catch it and give a sharp leading edge to the note. It’s important that you pluck the string sideways, rather than vertically, to avoid the string rattling against the frets. If I try to pluck with just my nails, my fingers dance haphazardly over the strings and the resulting music lacks assuredness. Likewise, there’s no need to ‘anchor’ the right hand by resting a finger on the woodwork. This limits what you can do and puts your hand in a poor position. 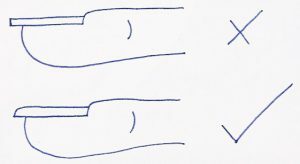 If you pluck the strings with the pads of your fingertips your fingers are already correctly positioned on the strings. Best practice technique is to have your right hand fingers approach the strings vertically from above, not from the right. Whilst there are stylistic reasons why you may occasionally vary from this, approaching the strings vertically from above (in both planes) will give the best control. There are so many fingerpicking patterns where the melody and bass string are played together or where all three strings are plucked at the same time. This gives advantage to using the thumb, as you can gently pinch the strings together between your thumb and fingers to pluck them. There are exceptions to every rule, but by consistently using the same fingers, you will quickly develop muscle memory and play more fluently. These are terms from classical music. Tasto means that the string is played (plucked) over the fingerboard, to the left of the strum hollow. This results in a mellow sound consisting of mostly the fundamental (original) note. By contrast in ponticello (or pont. ), the string is played close to the bridge, to the right of the strum hollow. Ponticello gives a bright, crisp sound with high harmonics included in the texture of the sound. Both are valid and by varying where you play you can significantly alter the tone. I tend pluck the strings just at the left of the strum hollow as a starting point, then vary towards tasto or ponticello to suit the phrase in hand. I hope you found this article helpful. You will have noticed that I used the term ‘best practice’ several times. To me, there is no ‘correct’ music and you can play what music you want and how you want. By all means learn best practice and then deviate from it for stylistic effect. But by learning best practice first, you will generally play better and avoid giving yourself problems later on. I have probably made many mistakes in my music career but one thing I don’t regret is spending a little time with the virtuoso guitarist Martin Simpson, leaning right hand technique to play fingerstyle well.